Demolition of the old terminal at Eisenhower National Airport in Wichita should be complete by June 2019. 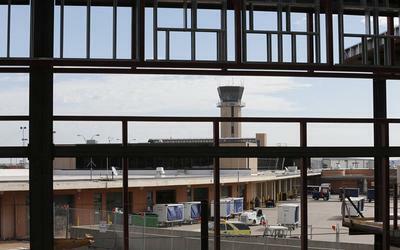 The demolition process for the old terminal at Wichita Eisenhower National Airport is entering its final phase. Workers will start asbestos mitigation and mechanical work this month to prepare for the building demolition this fall. The airport’s utilities will continue to operate out of the old terminal’s basement. "A good portion of the basement will remain intact. That’s our building utilities division. That basement portion is actually connected to our new terminal building with a tunnel," says Brad Christopher, assistant director of airports with the Wichita Airport Authority. He says a small office space at the west end of the terminal will also remain. Crews will take apart the “Magic Flight” sculpture in the coming weeks and move it to the new terminal. "We and the Arts Council wanted to retain the piece, and we think it will fit nicely in the new terminal facility," he says. The sculpture has been in the terminal since 1990. It will be cleaned, polished and then reassembled this fall in a new base that fits the design scheme of the new terminal. Christopher says this final phase of the terminal demolition project costs about $9 million and should be finished by June 2019. Once the terminal building is removed, a new security fence will go up around the open land to the air traffic control tower. The first phase of the terminal demolition — removing the airline concourses — was completed last year. That area is now paved for airline parking. Eisenhower Airport’s new terminal opened three years ago.